Thanks to TICA EO, Beth Terrell's "Red and Yellow Pages", various Siberian Breeders throughout the world. Around 1000 - The first time in recorded history the Siberian cat is mentioned. Throughout time the Siberian is listed in Russian history, in stories and fairy tales these amazing cats are considered protectors of the elderly, and favorites to children. cicra 1700 - The Siberian Cat is one of only three long haired cats represented in a cat show that takes place in England. 1900 -The first recorded entry of a Siberian Cat coming into the United States. Brought as a house pet from Russia. The first entry into USA found in a book -- originally published in 1900 by Helen M.Winslow entitled "Concerning Cats," "Mrs.Frederick Monroe of Riverside Ill. owns a remarkable specimen of a genuine Russian cat, a perfect blue of extraordinary size. The Russian long-haired pet is much less common even than the Persian and Angora." 1960 - A color-point, a feral cat, with a pointed pattern found in St. Petersbury, Russia along the Neva River. 1987- The first cat show in St. Petersburg, Russia takes place. This is also the first actual date of the breed showing of the Siberian Cat. 1990- The first three Siberians enter into the United States. Imported by Elizabeth Terrell to Baton Rouge, LA. Mrs. Terrell founded the Starpoint line with those first three cats. Ofelia, Naina, and Kaliostro. Their pedigress contained Roman. 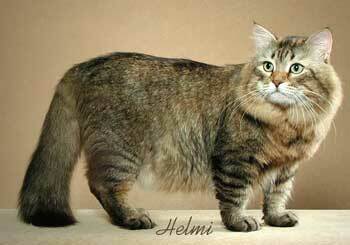 The Siberian is registered with the ACFA. 1991-The "Kotofei" club Show , January 5-6, 1991. 342 cats in the catalogue. 119 Siberians, including 29 colourpoints. The Novice class includes 50 Siberians, with 13 colourpoints. The eldest cat is nearly 10 years old. Offspring of Roman, Mars and dozens of other former novices. 1992- TAIGA siberian Breed Club formed . The first Siberian Breed Club was formed by Elizabeth Terrill for the promotion of the Siberian breed through out all registries. 1996-TICA accepts Siberians into championship. 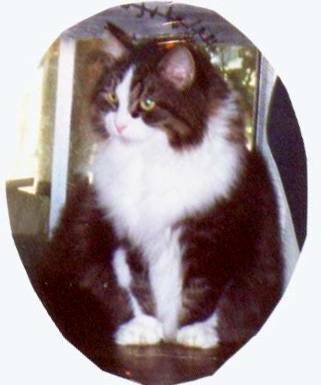 1998-First TICA Siberian supreme grand champion. 1999-First TICA Siberian supreme grand champion alter. 2000 - The Siberian is now registered with the CFA. 2001 - The Siberian is TICA's of the year. 2002-CFA accepts Siberians into Misc. 2006- CFA accepts Siberians into championship. The Siberian cat was one of the three longhairs represented at the first cat show held in England in the 1700's. The first recorded cat show in Russia was held in the city of Leningrad in 1987. Two cat clubs ‘Kotofei’ and ‘Kis’ organized it. This marked the beginning of breeding of pedigreed Siberians. Those roots were located in St. Petersburg, formerly Leningrad. The Soviet Felinological Association registered the Siberian breed. It included both the traditional colors and the Siberian color point. Literature has an entry about Siberian cats found in a book that was originally published in 1900 by Helen M.Winslow titled Concerning Cats, "Mrs. Frederick Monroe of Riverside, IL owns a remarkable specimen of a genuine Russian cat, a perfect blue of extraordinary size. The Russian long-haired pet is much less common even than the Persian and Angora." The first breeding Siberians were introduced in the United States in 1990 by Elizabeth Terrell. Mrs. Terrell imported the initial kittens as a trade for her Himalayans. They arrived in Baton Rouge, LA on June 28, 1990. Their names were KALIOSTRO VASENJKOVICH OF STARPOINT, OFELIA ROMANOVA OF STARPOINT and NAINA ROMANOVA OF STARPOINT. Ofelia at ten years old in my living room. The history of the pedigreed Siberian cat breed began in the Soviet Union with the history of felinological movement after the fall of the"Iron Curtain." The breeders that started breeding the Siberian had a difficult task because they had to start from from a scratch- study genetics and learn about international cat standards, breeding methods, etc. Work on the Siberian breed started between 1986-1989 in quite a few major cities. They began by creating the first cat fancier's clubs in those cities. The first semi-longhair cats, the forerunner of modern siberian Cats were first shown in 1987 at cat shows in Moscow and Leningrad. Soviet Cat breeders felt that the Soviet semi-longhair cats were distinctively different from their Western counterparts, so, the formed an idea that quickly spread to develop a separate semi-longhair cat breed. Different names were suggested for the new breed, but Siberian was chosen. Such a name was chosen not because the cats were brought from Siberia , but because the type of the cat with long thick water-proof hair was associated with the severe climactic conditions of Siberia. Also, the traditional name for big furry cats in Russia was Siberian Cat. In 1989 the Soviet Felinological Federation registered the Siberian breed. The standard, initially described by Mironova Olga Sergeevna, was eventually perfected. In 1991 this variant of the standard description is accepted by WCF as a working standard. The official standard was accepted by the expert commission of WCF in 1994 and was published in 1995. Roman, ancestor of many Siberians including the Starpoint first three.